Top 3 Download Manager 2013 includes Internet Download Manager (IDM), Download Accelerator Plus (DAP) and Free Download Manager (FDM). 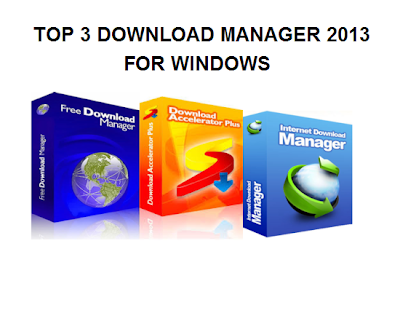 I am going to discuss the best download manager available for Windows users with their features and download links. Internet Download Manager is the number one download manager that I tried in my life. Even the free version of IDM gives excellent download speed. Internet Download Manager (IDM) works on multi-channel downloading scheme i.e. it download files from various channel at a time which increases the downloading speed. Download Internet Download Manager for Windows Here. The Problem with Internet Download Manager is that it works for only 30 days for trial version after that time period you have to register and buy full version. On the other hand DAP (Download Accelerator Plus) free version works for you lifetime. Download Accelerator Plus 10 is the new version which comes with some exciting add-ons like DAPsters which works when If you download files from RapidShare.com or similar sites, this add-on minimizes the annoying pages that usually precede downloads on those popular file-transfer sites and fast-tracks you to the CAPTCHA step (if there is one). Another great add-on is the Link Checker, which identifies valid and invalid download links before you actually hit the download button. Free Download Manager is all in one download manager. It can download videos form streaming sites like YouTube, Files from RapidShare like sites and also torrent files too. It can act as Torrent client too. Check out other best torrent client Here. Open Source: released under GNU GPL. HTTP/FTP/BitTorrent support: Download files from web sites from any remote server via HTTP, HTTPS and FTP. You can also download files using BitTorrent protocol. Pause & Resume: Just like any other download Manager it can resume broken links. Lite Version: You can also download FDM Lite which is around 3.8 MB with basic functionality.